Two sites connected by VPN with one site having two internet access connections. They connect using policy based VPN. 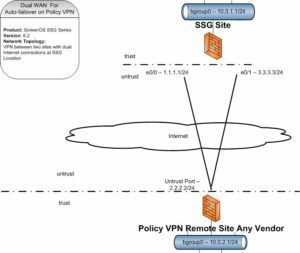 This configuration has a redundant internet link on one side of a policy based vpn connection. The creation of two gateways and a group allows for failover between the two links and setting one as the priority link. Configure an AutoKey IKE for each of the gateways and select the VPN group designating the primary connection with the higher priority number. This allows the two circuits connections to be treated as a single device to the VPN tunnel policy. The tunnel will associate with the group and can use either circuit connection but will prefer the higher priority one first.